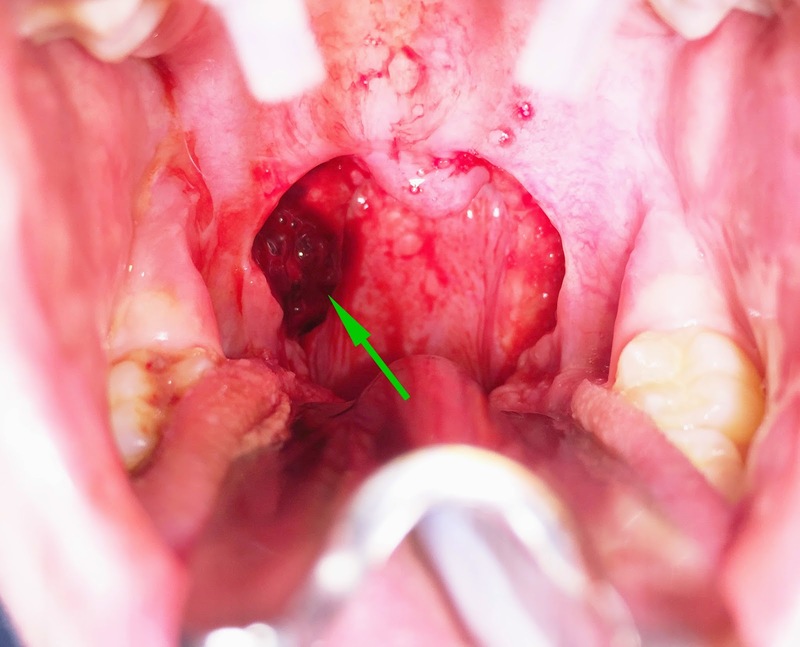 Bleeding after tonsillectomy is a very rare, but potentially life-threatening event. The often quoted probability of bleeding after this surgery is 1 in 1000. Many surgeons have statistics much better than this. I like to consider myself in this "better" group. But... no matter how good you are, if enough tonsillectomies are performed, statistically, a significant bleed after tonsillectomy will occur at some point no matter how well the surgery was performed due to factors beyond the surgeon's control. Most significant bleeds occur either within 24 hours after surgery or up to 10 days AFTER surgery. The majority of bleeds occur 5-10 days after surgery when the scabs start to fall off. Extrinsic factors that increase the risk of bleeding include winter season (from breathing dry air), dehydration, eating solid foods, and physical exertion. To minimize the risk of bleeding after tonsillectomy, hydration is extremely important. Using a humidifier to minimize the dry air during the winter is also helpful. Soft diet and avoiding exercise for 2 weeks is also recommended. However, should significant bleeding after tonsillectomy become a concern, one should immediately go to the closest ER. If there is only spots/streaks of blood or pink colored spit, one can gargle with ice cold water to help resolve minor bleeding. If one is able to look in the back of the mouth, a significant bleed may be present if it looks like any of these photos taken of a 5 years old patient from a few years back. In this situation, the patient should contact their surgeon and/or go to the closest ER. The first picture shows what things may look like BEFORE the back of the mouth is "cleaned up." 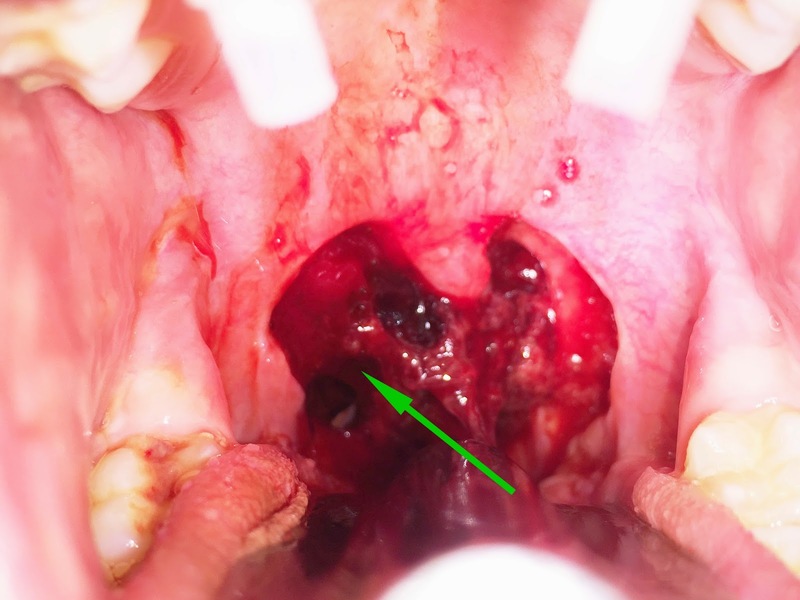 Bleeding is coming from where the right tonsil used to be depicted by the green arrow. The second picture shows what things look like AFTER much of the blood has been suctioned out. There is a large clot present covering the fossa where the right tonsil used to be. The bleed is under the clot causing the clot itself to slowly enlarge as well as ooze from around it. Treatment is complete removal of the clot followed by control of bleeding usually via silver nitrate or cautery. Typically, bleeding control can be attempted without sedation in an adult, but in children, general anesthesia is usually required. NORMAL appearance after tonsillectomy is shown in pictures here. I am a recovering tonsillectomy patient on day 23 of recovery. I have returned to the ER four times for major bleeds, one ended in an emergency surgery for a torn artery and the last bleed I had was on day 18 which they treated with silver nitrate. I just wanted to emphasize the importance of going in anytime you are concerned. If we hadn't gotten in as quickly as we did the time my artery was torn I did have probably died. Also you never know when your recovery might not follow the normal pattern. 40 years old man, had major bleeding on day 5. gone to surgery to stop bleeding. started to hear wind noise in my ear after day 8. still in massive pain. My good friend just died with a bleed. Two children left. 41 yr old female 8 days post tonsillectomy with major bleed with no provocation. Rushed to OR for cauterization. Overnight hospital stay for monitoring.